Many homemade veggie burgers have their flaws—whether they’re too starchy to hold up to a fluffy bun or crumble into the coals when you try to toss them on the grill. But not these beet-y bad boys. Packed with veggies and a variety of grains — including bulgur for a toothsome bounce and quinoa for a slight crunch — these veggie burgers are the real deal. While they require some substantial prep time up front, the end result is well worth the effort. Not to mention, the beets lend the burgers a blood-red hue reminiscent of ground beef, while the seaweed packs a flavorful superfood high-kick. 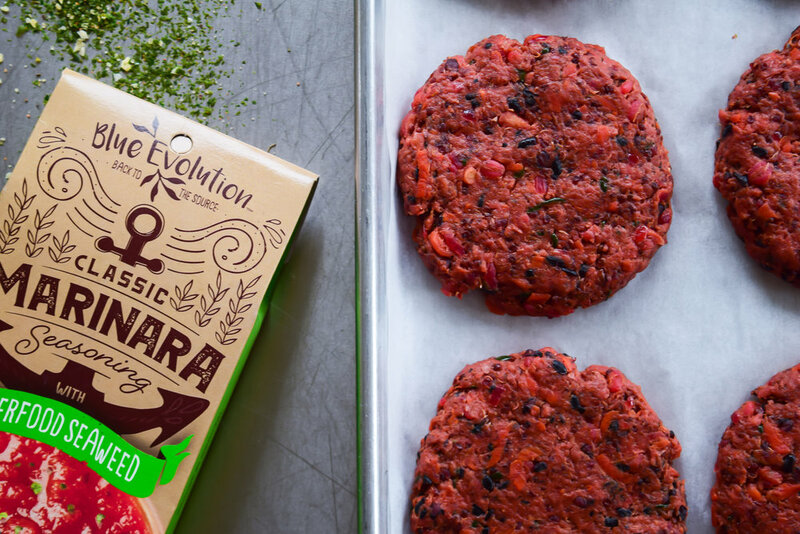 Whether you pan fry ’em or grill ’em up, these Seaweed Beet Burgers are sure to be the star of your late summer backyard barbecue. Grate carrots, zucchini and beet. Add olive oil to large pan and saute shallots until translucent. Add grated carrots, beets and zucchini and cook until softened, stirring often, approximately 5 minutes. Place cooked veggie mixture on a thin towel and let cool slightly. Once cool, twist towel to wring out excess water. Discard water and add cooked veggies to a large bowl. Add in roughly chopped garbanzos, cooked red quinoa, cooked bulgur wheat and cooked black rice. Stir vigorously to incorporate. Add 2 large free-range eggs, Blue Evolution’s Classic Marinara Seasoning Blend, stock powder/bouillon (optional), Braggs Liquid Aminos and nutritional yeast. Stir to combine ingredients until the beets have stained the mixture a vibrant dark pink. Using a 1/4 cup scoop, press mixture into patties and place on a lined baking sheet. Bake at 350F for 30-40 minutes until the burgers are browned at the edges and no longer soft in the middle. After the burgers have cooled, you can freeze them for future use, heat them up in a frying pan with a little oil or throw them on the grill to get a good barbecue char.